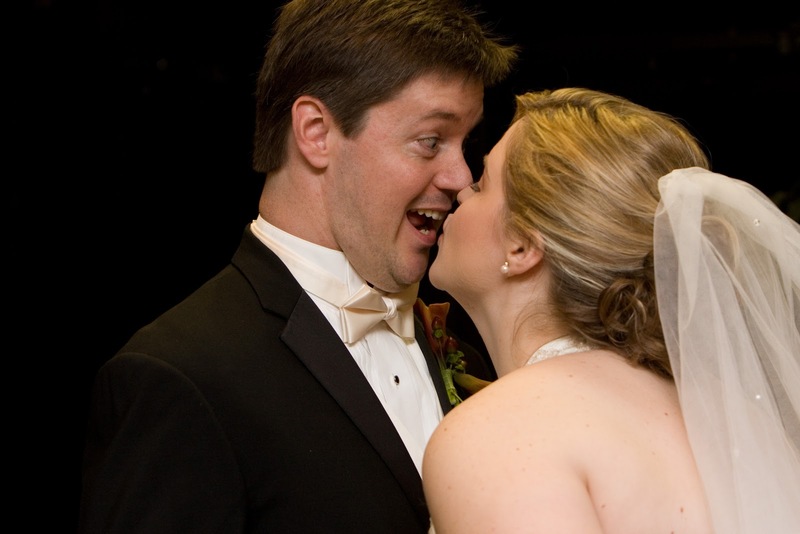 Little Mrs. Married: Marriage, & why we like it. 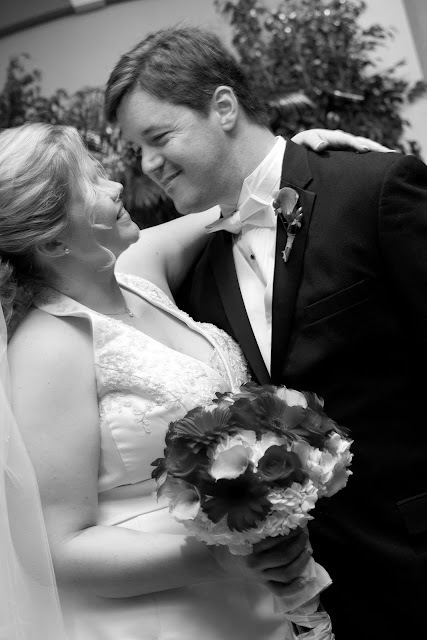 Today, we celebrate 2 years of marriage, my husband & i.
Oh, how i love him & how i love being married to him. It has TRULY (honestly) been the best two years of my life. We can't get over it. We talk all the time about how blessed we are, about how good we have it. I'm not saying these things to brag or anything like that, but i am completely & totally grateful to God for bringing this man back into my life. He was always the one for me. It just wasn't the right time when we dated back in 1997. God had a lot of growing up to do in both of us & the time was perfect in 2008. We were ready. I hated waiting that long. I thought God was *never* going to bring me "the one". But he did. And he definitely brought me the RIGHT one. If i didn't believe in soulmates before Brad came along - i did, but if i didn't - I would now. There is no better match for me. You can argue if you want. You can say that we can learn to live with anyone. I agree with that, too. But Brad has been so EASY to be married to! Sure, he is not perfect. He doesn't do everything exactly the way that i would. But he is perfect for me & there is no doubt to anyone who knows us well - we are definitely meant to be!! Lately, i have been thinking about how negative people can be about marriage. It really bothers me. If i say that i am so thankful for Brad, or for marriage, or anything like that, someone will say something negative. "Just you wait," they always say. They said it when we were engaged. "Oh, you're in love NOW. But just you wait till you are married." Then we got married & we heard, "Oh, you're all happy & such newlyweds NOW, but just you wait. Wait till you've been married for a year. The first year is the hardest. Just you wait." Now, we are celebrating two years & i am so thankful for our life together!! But people are still saying "Just you wait". And to be honest with you, it kinda gets on my nerves. At work on Friday we were sharing what we are most thankful for & i talked about my thankfulness for Brad. I asked my coworkers to just indulge me, since it is our anniversary & since he is truly who i am most thankful for. I told them about how he is the best husband EVER & how he is my best friend. i got some good comments, but i definitely got some negative ones. It bothered me. People always feel the need to make SURE you understand how incredibly difficult marriage is. I don't know why this is! People thanked God for their children & nobody said, "Well, just you wait! you love being a mom NOW, but just wait till they are two!" Nobody said that! But it's true! Parenting is hard! Why didn't anybody feel the need to warn the parents who shared their thankfulness for their kids? I know why. Because being a parent is WORTH IT. It doesn't matter that there are hard times as a parent. Because it's worth it all. Well, you know what? Marriage is the same way. It's WORTH IT. These comments bother me, but they do not discourage me. I think the reason people feel the need to warn me is because they think i am saying that my marriage is PERFECT. Well, i DO think our marriage is perfect, but i do not think our definitions of "perfect" are the same. Perhaps they think i mean that everything is just all-love, all-joy, everything is honky dory 24 hours a day, 7 days a week. But that's not what i am saying. I'm saying SURE we have our ups & downs, and SURE we have our disagreements, but there is no place i'd rather be in this world than right by his side. And that the positive FAR outweighs the negative. #1, Brad is very easy to live with. He's extremely laid back & he's not a neat freak, but he does pick up after himself. He's helpful & he is kind. That is just his personality. He's a good guy. #2, We talk about everything. Anything that bothers us will be discussed. This is KEY in ANY marriage, because it clears out misunderstandings right away. This keeps out resentment! #3, We are not selfish. This is not to say that i am NEVER selfish & that Brad is NEVER selfish, but in general, we are more interested in having a healthy relationship than in getting our own way. We put each other above ourself. This is also a key in any marriage. If you are going to be selfish, then yeah - your marriage is gonna be HARD. #4, We are not always pointing the finger at the other person. If there is a disagreement, i try to see it from his point of view, and i know he is the same way. We don't blame each other, but we try to look within - i try to see if i am the one that needs to change. He does the same thing. We are also both quick to apologize in any situation (no matter who is at fault). This is also a key in any marriage. If you are going to spend it yelling & screaming about how YOU'RE right & THEY'RE wrong, then yeah. Your marriage is in for some serious hardships. #5, we know how to be SILLY with each other. I think Silliness is a requirement for any successful marriage. HA! Really, we often have tickle fights & sing silly songs & those things make life more enjoyable!! Please understand, i am not trying to say that we are perfect & have it all figured out. Obviously, we are only at the 2 year mark, we have a lot of married living to do!! But i honestly cannot wait to see what is in store for us over the next, ohhhh, 65 years. Yay! It is so refreshing to hear you say all these things. Sure, hard times come and go, but as long as your perspective and attitude is right, then you're going to be good to go. I hope that whenever God sends me someone (if he does), I'll have a relationship similar to yours. Happy anniversary! I wish you many many many more! You are truly blessed! Happy Anniversary! I don't think it's bragging or that you should make apologies for a WONDERFUL relationship with an amazing man! Enjoy each other and your love! THIS is what I want..... THIS is what I'm praying for..... THIS is such a perfect example of what God created marriage for. This is such a lovely post - I'm glad you're happy! People can be so negative about marriage can't they? 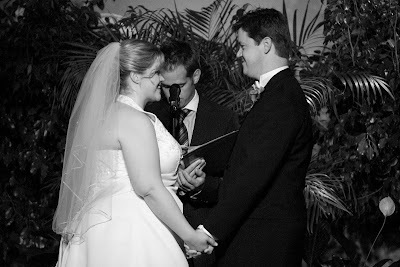 I've been married 3 years and this year has been the best yet, but we've had people make the same comments to us - that our marriage is bound to get worse over time. I guess it's good if you're aware and fighting against those kinds of attitudes - it's probably when you stop working and fighting for your marriage that you get into a rut! I never had anyone say anything like that to me. That's horrible that they would say that! Our first year of marriage was extremely difficult. We went through more than probably most newlyweds do, but it made us so much stronger for it! congrats on your first two years of marriage ... wishing you and your husband a lifetime of perfect memories to celebrate and re-live together each year. I am so happy to read about your life with Brad, and how happy you are, and how happy he makes you. I find it very disheartening that people try to steal your joy with their negative comments. In truth, they are probably jealous that they do not have what you have! Praise the Lord that you do not receive their negative views! It is possible to be happy, and to continue having a blessed relationship. The difference is that you love your mate, he loves you, and together you strive to have a happy marriage! I am so happy that you have this great marriage---I truly am! You deserve it, and we serve an awesome God, don't we! He has blessed you both, and it seems you never take each other for granted! May you have a lifetime of Happy Anniversaries! Happy Anniversary! As someone who's getting married next month--stories like this mean a lot to me! Congrats! aww. I love this post. Good advice too! Awesome post! Happy Anniversary a little late!! Marriage truly is a gift from God!